On Sunday, before leaving Cyprus, we visited the church of Aghios Antonios, which is in the ex Turkish section of Limassol. It was the name day of Aghios Antonios (Saint Anthony), so there was also a panigyri outside the church, where I had the opportunity to find various products which I have not eaten for many years. 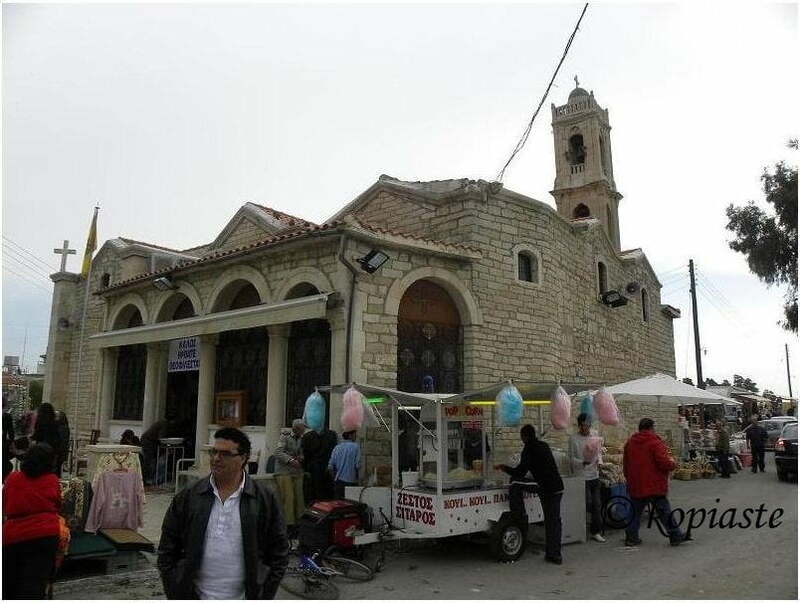 Aghios Antonios was our parish before the new church of Aghios Ioannis was built and was the church in which I was baptized and other members of my family got married. I have memories when I was very young and my mother would take me to church and the priest “Papa-Pefkos” had a lovely, stout voice which made you shiver hearing him chant. The church is in the ex Turkish section of the city and you can see the mosque just behind the church bell tower. As I have already written when it is the name day of a saint there is always a panigyri, which is a small fair around the churchyard with stalls selling local products. My visit to Cyprus was fantastic. Although the weather was not very good, mostly cloudy and cold, I had a great time visiting my family and friends for a few days. The days passed so quickly and all the days were full, visiting most of my relatives and of course, eating and eating (and again eating) all the time. Now that I am back, I would like to introduce you to some Cypriot products. Lokmades or l oukoumades, which is yeasted batter, fried and then drenched in syrup. Shiamishi, is cream wrapped in phyllo and fried. Pompes, are made with a similar yeasted dough as loukoumades but with a different shape. They have probably taken their name, which means bombs after their shape. Pischies are round pies with olive oil, sugar and cinnamon, which are fried and bathed in syrup or topped with honey. Koupes are savory sausage-shaped snacks which are usually food in panigyria, but also in bakeries. The outer shell is made from bulgur dough which are shaped into a tube and are filled with minced meat and onions and deep fried. Cypriot Sausages (Loukanika) are marinated in red wine flavoured with shinos, which comes from a shrub producing a berry, (similar to wild juniper berry) and are smoked. Lountza is made from the pork tenderloin. After the initial brining with salt and coriander seeds, it is marinated in wine and then it is smoked. Although it can be aged, many prefer younger, milder lountza. It is often cooked over coals or fried with eggs as well as a sandwich filler or part of a mezes. Chiromeri is stronger than lountza and is made from the leg, which is similar to any smoked, air-dried ham, although the wine flavour makes it characteristically Cypriot. Tsamarella is a unique product made of aged goat meat, which is covered with salt and orenogo and dried in the sun. 1 – 2) Two types of pastelli: one made from carobs and the other with nuts. 5 – 6) Dried fruit, such as figs, apricots, prunes etc andNuts, such as almonds, walnuts, hazelnuts, peanuts, pistachios, etc. as well as Shoushoukos made from grape juice. 9 – 10) Trahanas which is made with cracked wheat and fermented milk and dried, is used to make the soup with the same name and Shoushoukos. 11 – 12) Nuts and Coriander seeds. Some every day household objects such as hand woven baskets, sieves, pestle and mortars, bread molds, etc. Until recently, I used to think that louvana, was the same as yellow split peas (pisum sativum) or Greek fava (lathyrus clymenum). However, I was informed by Prof. Tania Valamoti, Assistant Professor, Dept. of History and Archaeology, at the Aristotle University of Thessaloniki, that Louvana is not yellow split pea but Lathyrus Ochrus, also known as Cyprus Vetch. After some searching, I found some pictures of the plant and that reminded me that in Cyprus, when the plant is still young and the leaves tender, we used to eat it raw or make a salad, which is again named “louvana” especially during Kathara Deftera (Cleen Monday). A few days ago I cooked Soupa Louvana, my way. The traditional way to make louvana is to boil the vetch until it is soft with rice and make the soup. It is served with “tiganissi” (fried onions) and lemon juice. Louvanosalata is a dip I made with this vetch. In Greece there is a dip made with a different vetch called “fava” (lathyrus clymenum) but the one I made had nothing to do with the Greek fava dip as it was a total new recipe of mine. Last night I made a toasted sandwich using Arcateno Bread, filled with halloumi, lountza and tomato. Today I did not want to spend the time in the kitchen as I also had to visit the dentist, so I prepared a pasta dish and used some of the pesto which I made during the summer and of course used some lountza and halloumi I brought from Cyprus. Moungra is pickled cauliflower made by a unique method of fermentation. All the recipes are included in my cookbook Mint, Cinnamon & Blossom Water, Flavours of Cyprus, Kopiaste! Happy to hear you had a wonderful time withyour family. What i would love to have is the sweets from there. Ivy, nice to see you back and bring us so many pictures of different snacks. I love the toasted sandwich! So tempting! Nice to see you back and happy to know that you had good time out there…..pasta looks yum…. Good evening and good luck for the dentist !!! Nice to have you back Ivy. I'd love a plate of that soup and that pasta dish must be wonderful. Mmmhhh, so tasty! A lovely dish! I'm glad you had a good time Cyrus! Your pasta as well as that sandwich look delicious! Have fun at the dentist! hi ,ivy!welcome back,i missed you!your post about cyprus is so interesting!and so beautiful,of course!the pasta dish is delicious!i expect your next post!see you,good night! So many delicious-looking things here! Your pasta looks great, and the split pea soup and halloumi sandwich look incredible too. Looks like you had a great time Ivy. Your fussilli looks superb – delicious! Good to see you back and safe from your travels…love all the Cypriot produce. I like all your recipes especially that soup and sandwich…yum! your posts are so detailed , and the food and the recipes so varied and flavorful that it makes me want to buy a ticket and go to Greece!! I wish I will be able to do it sometimes and enjoy the abundance. Merci Ivy pour ce voyage que tu nous fais faire. Une autre manière de faire les fusillis que je note, même si je n'ai de lountza. Sorry ! Now it is the right link ! (it's food colouring ) Grazie ciao ! I was thrilled to see this post of yours; we were just talking yesterday with my kids of visiting Cyprus and both my son and daughter were excited at the thought. This is giving me an advance taste of all the wonderful offerings in the country! It is so nice to be able to purchase great products at the market and make easy and tasty meals at home. Joumana, that would be great if you visited Cyprus. I wish I would be there as well to meet you and your children. I have thought many times of visiting Beirut and maybe in a future visit I can combine visiting both countries. Beautiful photos of the panigyri in Cyprus: I would like to go there and taste all these good things! Nice recipe with fusilli! φιλάκια! Welcome back! I am sure you had a wonderful time. The variety of products looks great and I only wish I had access to them! I enjoyed learning about Cyprus and all the delicious products! The pasta dish sounds fantastic! I'm so happy to hear you had such a great getaway! I'm glad you had such a lovely time eating and eating and doing more eating! I wish i was off for a few days somewhere! Although I wouldn't describe myself as a cheese lover I really like the look of that halloumi sandwich. Welcome back Ivy, and I see you brought lots of goodies from Cyprus. Greece & Cyprus must do a better job of promoting our wonderful charcuterie. I'm really curious to try out all these meats. Welcome back Ivy. It looks like you had a terrific time! Your explanations of the food products of Cyprus is amazing and your dish looks very appetizing. How I miss ta panigyria! It's the perfect place to buy some great food products! Sounds like it was a wonderful trip. The dessert photos are gorgeous!! Your pasta dish looks terrific! Everything you made looks so delicious Ivy! Especially the pasta with mint pesto. Love the pictures of the market foods. I wish I could try some of them! Trop bon une bonne recette de pâtes !! En France aussi on adore ! Welcome back Ivy and what a visual treat this post is! Delicious looking food as always, Ivy. I've never had louvana and from your description it sounds like something I would love. I will have to try making it – anything with caramelized onions and lemon must be delicious. Welcome back! We missed you Ivy! Glad to hear you enjoyed your time with your sister and Cyprus! This dish looks very nice … love your mint pesto! Enjoyed all the pix and stories! Thanks for the lovely post. I lived in Cyprus for two years and the food is awesome.